← Another Blueberry muffin recipe! I know I haven’t posted in a while, but this recipe was worth posting for! Its oatmeal with a boost of immune boosting and antioxidant rich flaxseeds and berries and muscle repairing protein! 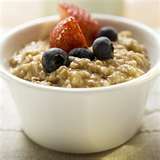 Oatmeal is a low glycemic, high fiber food that is also filling and a great addition to your healthy breakfast. Flaxseeds are known to help lower inflammation and are high in cell repairing omega 3 fatty acids. And whey protein is a highly bioavailable source of amino acids for the repair of muscles and tissues in your body. I even eat this for dinner sometimes when crunched for time.